Vegas Fastener & Mill Supply Expo Sets All Time Record With The Addition of Glebar! The [Expo] has broken it’s all time exhibit space sales record with today’s addition of the Glebar Company, Franklin Lakes, New Jersey, it was announced today by Susan A. Hurley, CEM, General Manager. “We are delighted to report that the Expo has now reached 822 booths, which exceeds the previous high of 821 booths established in 2007." 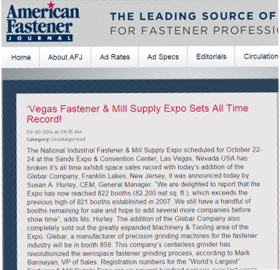 Reported via American Fastener Journal.